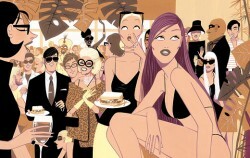 His hip and retro looking yet contemporary illustrations adorn everything from clothes and bags to pens and notebooks. He has produced murals for the Sandwich & Friends chain and now has a womenswear store here in Barcelona on Carrer de Rosselló. A friend who was visiting very kindly bought me the one in the photograph from Cereria Subirà. 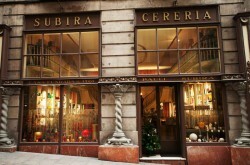 This candle shop dates back to 1761 and is the oldest shop in Barcelona. 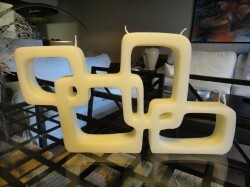 It still has the original baroque décor and is great for presents or just to browse the hundreds of candles on offer. Quite apart from the candles in Jordi Labanda’s collection some of the shops own designs are truly amazing. And the smell is something else too. I’m not quite sure how well the thing is going to burn. I think there needs to be a certain degree of candle management. But I’m certainly looking forward to lighting it. Once I find something to put it on that is. You can visit the Jordi Labanda Shop on Carrer de Rosselló, 232. See his murals at various Sandwich & Friends throughout Barcelona. Or buy the candles at Cereria Subirà on Baixada de la Llibretería, 7. What a fab shot of the candle shop!